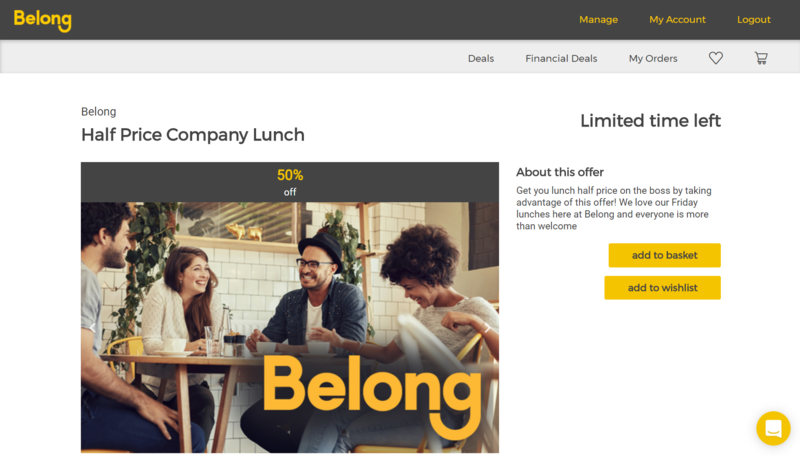 Below is a quick guide to making the most of the Belong website so you can find and redeem the best deals we have available to you. Once you've activated your Belong account using the link provided in the Belong Welcome email you can start using our website. If you haven't been sent this email make sure you check your spam folder or get in contact with your HR manager so they can re-invite you. 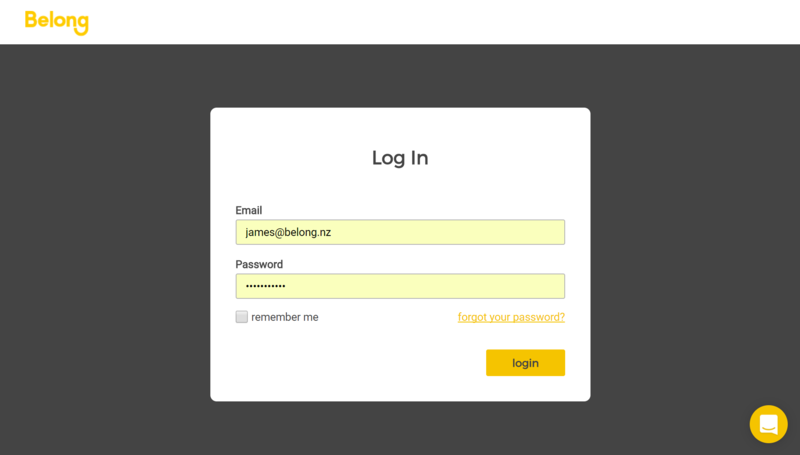 Using the email and password you set up on activation, you can login to Belong at you.belong.nz. Forgotten your password? Simply click on the "forgot password" link on the login screen. If it's your email that's not working just get in contact with us using the messenger icon in the bottom right of the screen and we'll get things sorted for you. The deals page displays a preview of all the deals on offer to you. The default order of deals takes your personal interests and location of the deal into consideration, so you can spend less time scrolling and more time redeeming. Each deal displayed shows its title, who its from, and, the discount amount. You will also see a heart icon that allows you to save an offer to your wishlist for later. Depending on the deal, you will see either a cart icon, or an icon to link to a website, phone number or new email. There are many ways each deal can be claimed, some may only be a link to a special website address and some may be a downloadable voucher. If you're looking for something in particular, use the search bar to filter deals by your search words (e.g. food, dinner, coffee). Clear your search (reset the deals page) by clicking on the 'x' in the search bar. You can find financial deals by clicking on 'financial deals' in the grey toolbar at the top of the page. Financial deals are services provided to you by Belong or your employer that you wouldn't be able to receive as an individual. If you still want more information about the offer, don't hesitate to contact us using the messenger icon in the bottom right hand of the screen and we'll help you out. If you're happy with the deal you've selected, you can purchase it by clicking on the "add to basket" button (if it's a discounted amount you won't need to make a payment). If the deal does not generate a voucher - you will see either a link to a website, email address or phone number that you can use to claim the deal. 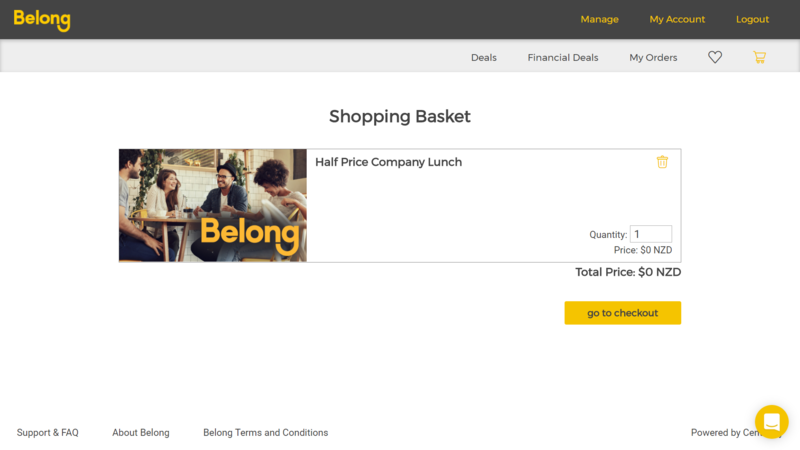 To view and manage deals in your basket you can click on the cart icon in the grey toolbar. Alternately if you want to save the deal for later click on the "add to wishlist" button. To view and manage these wishlisted deals you can click on the heart icon on the grey toolbar. To complete the purchase of a deal go to you shopping basket by clicking on the cart icon on the grey toolbar. Here you can make your final decision on completing the purchase of a deal. When you're satisfied with your selection, click on the "go to checkout" button. Confirm your purchase to receive the QR code and voucher ID of your purchased deal. This is what you will display to a merchant when redeeming the deal. 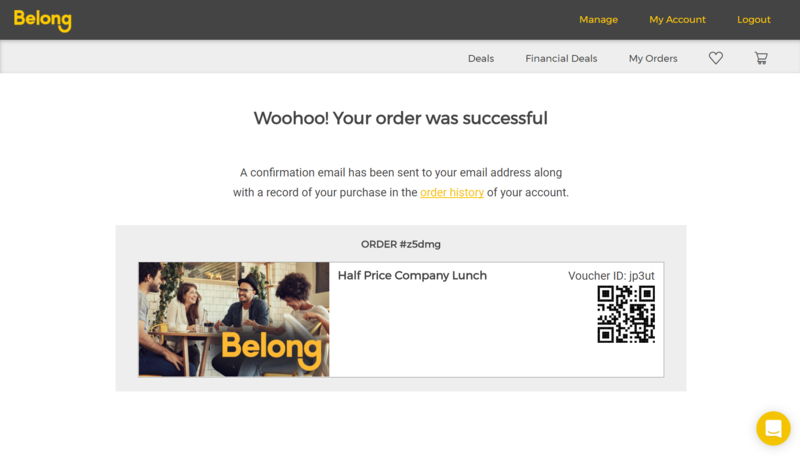 These confirmation details will be sent to your registered email as well as being kept in your order history which can be accessed by clicking on "My Orders" in the grey toolbar. 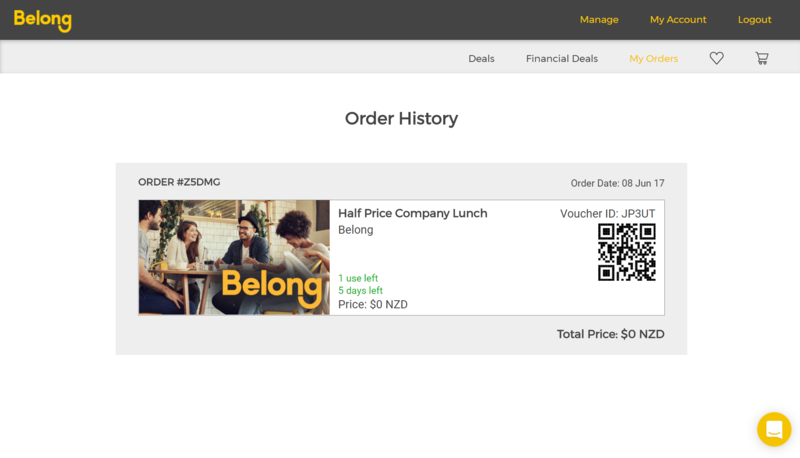 The deals in your order history will link you to the original offer by clicking on the image. It will also tell you how much time you have to redeem the offer and how many redemptions you have left. Show this page to merchants when redeeming your offers. 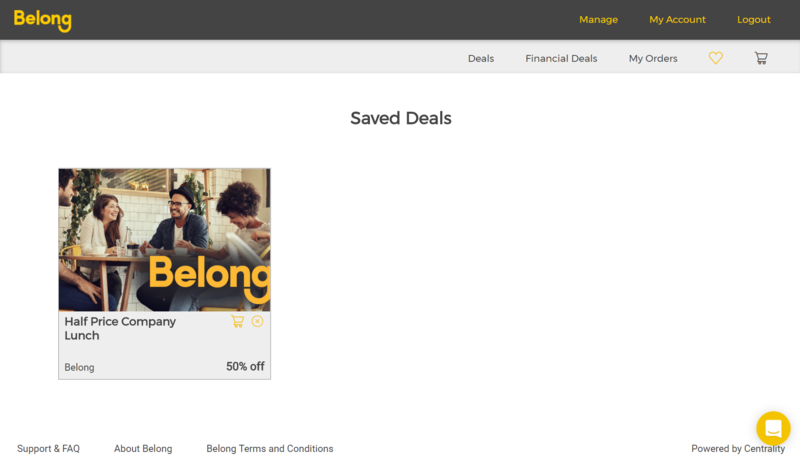 View your saved deals by clicking on the heart icon on the light grey toolbar at the top of the page. Here you can move deals into your shopping basket and delete them from your saved list. To update your details or change your password click on "my account" on the dark grey toolbar at the top of the page. Here you can update your name and contact phone number, as well as change your password.